A little more than a week after she suffered a heart attack, Clora Bryant is characteristically full of vim and vigor. At 79, the world’s best-known female jazz trumpeter-she prefers “trumpetiste”-the woman who cracked a brass ceiling that is not yet completely undone, is very much still here, her warm, maternal image contrasting dramatically with her smooth-lacquered, flower-in-the-hair publicity photos from the ’50s. Living in a Crenshaw district apartment in Los Angeles, a bugle call away from where she spent most of her adult life, close by the still resonant memories of the Central Avenue jazz scene, she is surrounded by on-going projects: an autobiography that will be published as a paperback and as an audio book, complete with music and sound effects; a series of her one-on-one interviews with Dizzy Gillespie and numerous other veteran jazz artists; and a pair of children’s books. “One is about a little elephant,” says Bryant. “The other is about little twin blackbirds, and one’s in love with Dizzy and the other is in love with Charlie Parker. The combination of practicality and inner drive expressed in her comment has been a principal element in a 60-plus year career that has taken Bryant from all-female college bands in Texas to jam sessions with Dizzy Gillespie and Charlie Parker and an active career as a well-regarded side-person; from the perils of the Depression, a broken family and a predatory relative to the present day joys of a life surrounded by her four children, nine grandchildren and two great-grandchildren. Strangely enough, Bryant has no recollection of having experienced any heat over the fact that she was a female who played the trumpet. “Never happened,” she says. “Nobody ever told me, ‘You can’t play the trumpet, you’re a girl.’ Not when I got started in high school and not when I came out to L.A. My father told me, ‘It’s going to be a challenge, but if you’re going to do it, I’m behind you all the way.’ And he was. Bryant would eventually share a musical friendship, even a mentorship, with Gillespie that would last until the bebop great died in 1993. But her most memorable musical moment took place in the early ’50s at a jazz bistro in Hermosa Beach called the High Seas. “It was a Sunday afternoon, and it was always wild at the beach on a Sunday,” recalls Bryant. They were trying to get Charlie to play at the club next door, the Lighthouse, but no one could get him to sit in. Then he came over to where I was playing, borrowed a new Selmer tenor from somebody, and said, ‘Well, what do you want to play Clora?’ And I said, ‘Now’s the Time.’ So I set the tempo like [she beats off a fast tempo] and everybody got really swinging. “When we finished it, the piano player played the old Basie lick on the end. So Charlie said, ‘Hey, how about some ‘Tickle Toes’? I said, ‘Yeah, ‘Tickle Toes! ?’ And Charlie counted it off like [beats off a much faster tempo], and he was flying. So when I started playing, I tried to double up the tempo like he was doing. And when we finished, he grabbed me by the arm and dragged me in the back. ‘Clora,’ he said. ‘You know I love you and I love the way you play. But don’t try to double up like that when you can’t do it!’ And then he gave me a big fat hug. In 2002, she was awarded the Mary Lou Williams Women in Jazz Award at Washington, D.C.’s Kennedy Center. 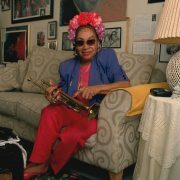 And a documentary by filmmaker Zeinabu Irene Davis, Trumpetistically, Clora Bryant, details Bryant’s life with rare footage from television shows and live performances, as well as scenes from her pioneering tour of the Soviet Union in 1989 (she was the first female jazz horn player to do so). Bryant just chuckles when the honors and media interest are mentioned. “Wish they’d been around 40 years ago,” she laughs. She’s obviously pleased about the numerous requests for interviews and appearances. But she also insists upon placing it all in the context of the wisdom from her father. Clora Bryant’s lone leader session, Gal With a Horn: Clora Bryant/4, first released on Mode in 1957, was reissued by VSOP on CD in 1996. The trumpetiste also appears on blues singer Linda Hopkins’ How Blue Can You Get, available on CD from the Quicksilver label.